During this time, the student completes a significant portion of their baccalaureate degree while being introduced to the basic medical sciences. The Fundamentals of Medicine series (I-IV) builds on communication skills and learning to perform a patient-centered interview. This provides the students an opportunity to learn more about themselves, their profession, and further develop effective interviewing skills. The Fundamentals of Medicine series offers a unique theme each semester: women’s health (Fall Year 1), geriatrics (Spring Year 1), pediatrics (Fall Year 2) or adult medicine (Spring Year 2). Presentations on various medical symptoms and clinical findings are provided to integrate anatomy and physiology with medical history-taking, and provide a format for learning about developing a differential diagnosis based on the patient’s history. In addition, clinical experiences begin immediately through the docent team experience and continue to advance as the student progresses through the six years. During docent team, teams of 10-12 students meet for two hours each week during the semester with the docent (teaching physician) at one of our partner hospitals. Information learned in the classroom is integrated throughout this clinical experience. Bridging the first two years, students spend one week during the summer semester completing the Hospital-Team Experience. This experience provides a greater understanding of the roles of patient care professionals and the hospital community as a team caring for the patient. Students will join a new docent team consisting of Year 3 – 6 students and a variety of health care professionals. 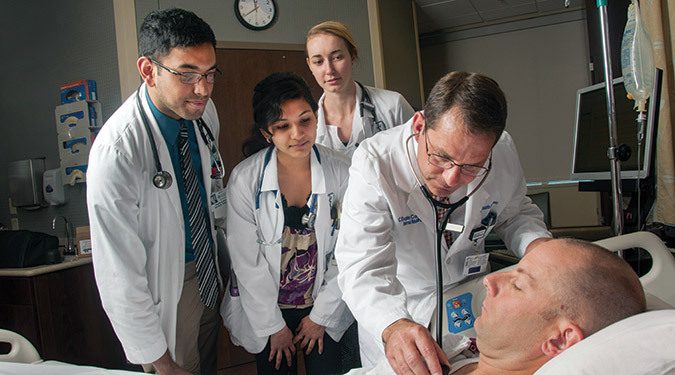 At this time, students move from classes primarily on the UMKC Volker Campus to the Hospital Hill Campus for intensified basic medical science courses that will prepare students for increased clinical responsibilities. As a part of the docent team experience, students will spend one-half day per week assisting with the diagnosis and treatment of patients in outpatient clinics at two partner hospitals. The clinical assignment provides continuity of patient care, as well as a wealth of clinical experience. In Year 4, students will return to the UMKC Volker campus to complete coursework towards the baccalaureate degree. While completing the undergraduate degree, students continue to participate in clinical assignments. During the last three years of the program, students have a number of experiences to complete the curriculum. Students will be immersed in a one-month rural Missouri preceptorship that provides experiences in societal and health care concerns unique to non-urban primary care settings. Two months a year, students join their full docent team for daily ward rounds called docent rotation. This docent rotation, month-long clinical rotations and continuing care clinic make up most of the final three years. Clerkships in Emergency Medicine, Family Medicine, Obstetrics/Gynecology, Pediatrics, Psychiatry and Surgery are the required medical school clerkship offerings in the final two years. * Three to 12 credit hours will come from general degree requirements and/or core major requirements. **Students may take 6-7 electives in year 6. They must choose three clinical electives from nine designated categories. One of these electives must be a critical care elective.